Getting published is not easy and, as the saying goes, it's who you know that counts. Below is a sample cover letter (otherwise known as a query letter) sent by an aspiring writer to a literary agent. In this case, the first-time author had a connection to the agent. Because of this, and because agents are very busy people, the writer kept the letter brief and to the point. One of your authors, my friend Olivia Oh, spoke with you recently about a middle-grade novel I wrote. I am sending it for your consideration. "It's Me! Rhonda Michaels" is a contemporary story set in a high rise apartment in Los Angeles. The hero is thirteen-year-old Rhonda Michaels, who is on a quest to find her brother, who has run off with the circus. It is my first novel, and it is 38,000 words long. The book is enclosed. Thank you in advance for your time. 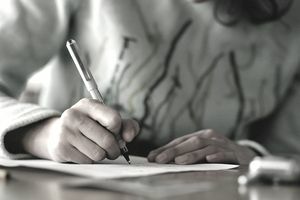 The point of the cover letter is to give context to what an agent is about to read, to interest the agent in you as a writer, and to give the agent some ideas about how they might begin to market and sell your work to editors and publishing houses. The writer above accomplishes this by noting the genre, setting, and plot. You'll notice that the author is concise and to-the-point. The author does not pad the cover letter with unnecessary information, nor does the writer waste any time getting right to the point of the letter. One of the most important aspects of the letter to note is that the writer begins her inquiry by referencing who recommended her (Olivia Oh). Any connection you have to the agent is extremely important. It might be the difference between having your manuscript read or tossed in the trash. Therefore, always begin your cover letter with your "in," which in this case is who you know, especially if your colleague is accomplished. You'll also notice that the writer does not mention any previous publications. That's because this is their first novel and is likely their first attempt at a fictional publication. However, if you have publications that are relevant (i.e., fictional publications in literary magazines, other books that have been published, or relevant essays) then by all means highlight that in your cover letter. Similarly, if you have relevant experience, you should also mention it. However, don't use your cover letter as a biography or resume. A cover "letter" is just that, a "letter." By relevant experience, that means experience that somehow informs your abilities as a writer. For example, if you held an administrative position in a publishing house, that is not relevant experience because it doesn't speak to your skills as a writer. If however, you graduated from an MFA program or won an award for your writing, you should mention that in your cover letter.